Rene Vidal is the Herschel Seder Professor of Biomedical Engineering and the Inaugural Director of the Mathematical Institute for Data Science at The Johns Hopkins University. He has secondary appointments in Computer Science, Electrical and Computer Engineering, and Mechanical Engineering. He is also a faculty member in the Center for Imaging Science (CIS), the Institute for Computational Medicine (ICM) and the Laboratory for Computational Sensing and Robotics (LCSR). Vidal's research focuses on the development of theory and algorithms for the analysis of complex high-dimensional datasets such as images, videos, time-series and biomedical data. His current major research focus is understanding the mathematical foundations of deep learning and its applications in computer vision and biomedical data science. His lab has pioneered the development of methods for dimensionality reduction and clustering, such as Generalized Principal Component Analysis and Sparse Subspace Clustering, and their applications to face recognition, object recognition, motion segmentation and action recognition. His lab creates new technologies for a variety of biomedical applications, including detection, classification and tracking of blood cells in holographic images, classification of embryonic cardio-myocytes in optical images, and assessment of surgical skill in surgical videos. Signal processing: consensus on manifolds, distributed optimization, compressive sensing. Computer Vision: History, the Rise of Deep Networks, and Future Vistas, Invited talk, Panel on Perception and Cognition, MORS Meeting on Artificial Intelligence and Autonomy, February 2019. Mathematics of Deep Learning, Invited talk, Medical Imaging Summer School, Favignana, Italy, July-August 2018. Mathematics of Deep Learning, Invited talk, 2nd International Summer School on Deep Learning, Genova, Italy, July 2018. Artificial Intelligence and Machine Learning in Biomedicine and Health Care, Invited talk, AAMC Grand Spring Conference, Washington DC, 2018. Global Optimality in Structured Matrix Factorization, Invited talk, ICCV Workshop on Robust Subspace Learning and Computer Vision, Santiago de Chile, 2015. Professor Vidal received his B.S. degree in Electrical Engineering (valedictorian) from the Pontificia Universidad Catolica de Chile in 1997 and his M.S. and Ph.D. degrees in Electrical Engineering and Computer Sciences from the University of California at Berkeley in 2000 and 2003, respectively. He was a Research Fellow at the National ICT Australia from September to December of 2003, and an Assistant and Associate Professor in the Department of Biomedical Engineering of The Johns Hopkins University from 2004 to 2010 and from 2010 to 2015, respectively. Dr. Vidal is currently a Full Professor in the Department of Biomedical Engineering of Johns Hopkins University with secondary appointments in Computer Science, Electrical and Computer Engineering, Mechanical Engineering. He is also a faculty member in the Center for Imaging Science, the Institute for Computational Medicine and the Laboratory for Computational Sensing and Robotics. In 2017, he became the Innaugural Director of the Mathematical Institure for Data Science (MINDS). He has held several visiting faculty positions at ENS Paris-Saclay, Stanford, INRIA/ENS Paris, the Catholic University of Chile, Universite Henri Poincare, and the Australian National University. Dr. Vidal is co-author of the book ``Generalized Principal Component Analysis" (2016), co-editor of the book ``Dynamical Vision" and co-author of over 200 articles in machine learning, computer vision, biomedical image analysis, hybrid systems, robotics and signal processing. Dr. Vidal is or has been Associate Editor in Chief of Computer Vision and Image Understanding, Associate Editor of Medical Image Analysis, the IEEE Transactions on Pattern Analysis and Machine Intelligence, the SIAM Journal on Imaging Sciences, Computer Vision and Image Understanding, and the Journal of Mathematical Imaging and Vision, and guest editor of the International Journal on Computer Vision and Signal Processing Magazine. He is or has been program chair for ICCV 2015, CVPR 2014, WMVC 2009 and PSIVT 2007. He was area chair for AAAI 2016, NIPS 2015, MICCAI 2013 and 2014, ICCV 2007, 2011, 2013 and 2017, and CVPR 2005, 2013 and 2017. 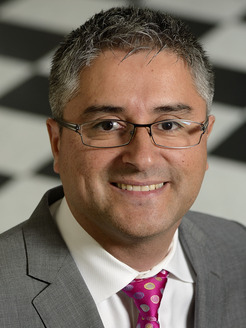 Dr. Vidal is recipient of numerous awards, including the 2017 Jean D'Alembert Faculty Fellowship, the 2012 J.K. Aggarwal Prize for ``outstanding contributions to generalized principal component analysis (GPCA) and subspace clustering in computer vision and pattern recognition", the 2012 Best Paper Award in Medical Robotics and Computer Assisted Interventions (with Benjamin Bejar and Luca Zappella), the 2011 Best Paper Award Finalist at the Conference on Decision and Control (with Roberto Tron and Bijan Afsari), the 2009 ONR Young Investigator Award, the 2009 Sloan Research Fellowship, the 2005 NFS CAREER Award and the 2004 Best Paper Award Honorable Mention (with Prof. Yi Ma) at the European Conference on Computer Vision. He also received the 2004 Sakrison Memorial Prize for "completing an exceptionally documented piece of research", the 2003 Eli Jury award for "outstanding achievement in the area of Systems, Communications, Control, or Signal Processing", the 2002 Student Continuation Award from NASA Ames, the 1998 Marcos Orrego Puelma Award from the Institute of Engineers of Chile, and the 1997 Award of the School of Engineering of the Pontificia Universidad Catolica de Chile to the best graduating student of the school. He is a fellow of the IEEE (2014), fellow of the IAPR (2016), and a member of the ACM and SIAM. If you are interested in joining my lab, please apply directly to the department your are most interested in: Applied Mathematics and Statistics, Biomedical Engineering, Computer Science, Electrical and Computer Engineering, or Mechanical Engineering. Please make sure to mention my name in your statement of purpose. Once you have applied, please send me an e-mail with a subject such as 'PhD Application to BME 2009'.